IAF completes extensive drill, with official revealing it can launch barrage of 3,000 'very smart' 1-ton missiles, downing a state in days. The Israeli Air Force (IAF) this week completed a wide-reaching drill that included all branches of the force. In the drill, named "Over and Over," the plane division was put through its paces, including fighter jets, combat and transport helicopters, as well as personnel and equipment carrier planes. The technical division was also drilled, as was the maintenance division. 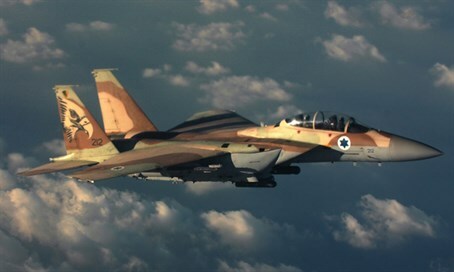 A senior official in the technical division of the IAF explained that the force's abilities have grown to the point that it currently is able to rapidly unleash 3,000 missiles weighing one ton each - "very smart missiles" according to his definition. He explained that within four days of fighting, a barrage of that sort would be enough to topple a state. "We are talking about a missile installed on a F-15 or F-16 that is fired from a height of 30,000 feet," said the official. "The moment the pilot fires the missile it is able to go exactly to the target and destroy it." Also taking part in the drill, which was mostly held at night, was the Sikorsky CH-53 heavy-transport helicopter division. The commander of Sikorsky CH-53 Squadron 114, which is also known as the "Night Leaders Squadron," said, "this is the main point of our mission, we know to transport the forces and to put them down." "These are activities that are mostly conducted at night, and if you don't train in a fixed manner at least once every two weeks, you lose your skill." The IDF is concluding the drill on Thursday evening, analyzing the training so as to better ascertain the IAF's current level and how destructive it can be in warfare.